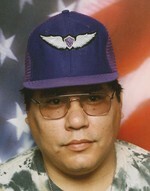 January 3, 1963 - July 4, 2009 SALEM - Beloved brother Joseph Eli Glass passed away Saturday July 4, 2009 in Miami, Oklahoma at the age of 46 years. Joseph was born January 3, 1963 to his parents Carl Glass Sr. (retired Senior Master Sergeant of the United States Air Force) and retired nurse Cordelia B. Conner at Burrdrop Air Force Base, United Kingdom. Joseph loved to work puzzles and listen to music. Joseph enjoyed arts and crafts such as latch hook, macramé, and model airplanes. Joseph was a true supporter of our troops past and present defending our nation. Although Joe is no longer with us, he will be remembered as a man with a very loving heart who never saw bad in any person. He is survived by 1 brother: Sonny and Deanna Glass of Miami, Oklahoma, 2 sisters: Vicki Jones of Guthrie, Oklahoma and Katherine Kay O'Leary of Kansas, Oklahoma, 2 nephews and 5 nieces and 3 aunts. Funeral services were held July 7, 2009 at the Seneca A.O.A. Building at the Seneca Tribal Grounds located on Hwy 10 North of Grove, Oklahoma with Ceremonial Speakers: Paul Barton and Speaker Rick Combs. Burial followed at the Seneca Tribal Grounds. Pallbearers included: Paul Jones, Steve Jones, Don Patchin, Dennis Conner, Brad Knight, Howard Cogburn. Honorary Pallbearers: Patriot Guard Riders. The Family sat with Joseph as tradition, Sunday July 5, 2009 until his service Tuesday morning.